When it comes to futuristic racing games, the Wipeout series has been going strong since it first appeared on the Playstation back in 1995. 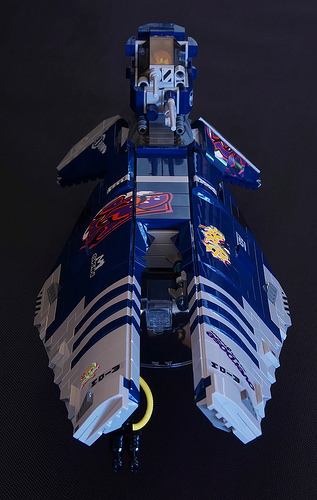 Thanks to Volker Brodkorb, we can now enjoy two Wipeout racers in LEGO form, such as this sleek-looking bad-boy. The builder has done an excellent job at using curved slope elements and hinges to form the aerodynamically shaped body. The red, white and blue color scheme is also particularly well-executed. Next up is an exciting ride comprised of dark blue and different shades of gray. The split down the front-end of this flying vehicle makes for an excellent contrast to the first model. This one also makes good use of custom cut stickers from the Ninja Turtles Shellraiser.